Robert Herrick: To The King and Queen Upon Their Unhappy Distances. These eyes of mine shall see you mix again. The words found true, C. M., remember me. 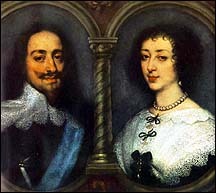 Charles I of England and Henrietta Maria of France. c. 1635. From Web Gallery of Art. London, Lawrence & Bullen, 1891. 29. Copyright ©1998-2007 Anniina Jokinen. All Rights Reserved. Created by Anniina Jokinen on October 9, 1998. Last updated on January 18, 2007.